Last weekend was a busy one. I have 4 amazing friends all four who chose that weekend to marry. Not only that but one of the brides from Sunday officiated and married the first two on Saturday. Just how cool is that! None of this would have even been possible if R 74 had not passed and it would have been, and it was, a crime that these 4 beautiful, intelligent and loving women were unable to publically celebrate their love just as every other loving couple does. It is with gratitude and thanks to the people of Washington State who past R 74. If any of you ask was it worth it? All you have to do is look at the faces of these 4 beautiful people. 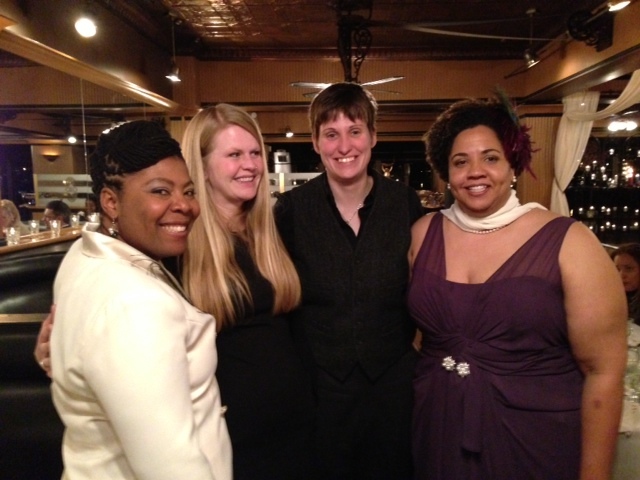 On January 23 Heather and Aubrey celebrated their commitment and love with great fanfare and joy. On Sunday January 24 ML and Judy celebrated their 19 years together with a joyful ceremony of commitment and love. So with great love, congratulations and the raising of the wedding cup I congratulate the joining of two couples who belong together. Heather and Aubrey may you live long lives together. May the strength you gain from each other sustain you over the rough places in your journey, and may your hearts soar together when all is smooth sailing. ML and Judy, over the last 19 years you have loved each other unconditionally even when our state said you couldn’t. Such love deserves to be recognized and celebrated. God blessed your union 19 years ago and you have waited long enough to celebrate that blessing. Thank you for sharing your joy with the rest of us. As each of you travel together on life’s journey may the Holy Spirit surround you, may Christ lift you up if you stumble, and may God hold you in palm of Her hand whenever you are weary. Shalom my friends.